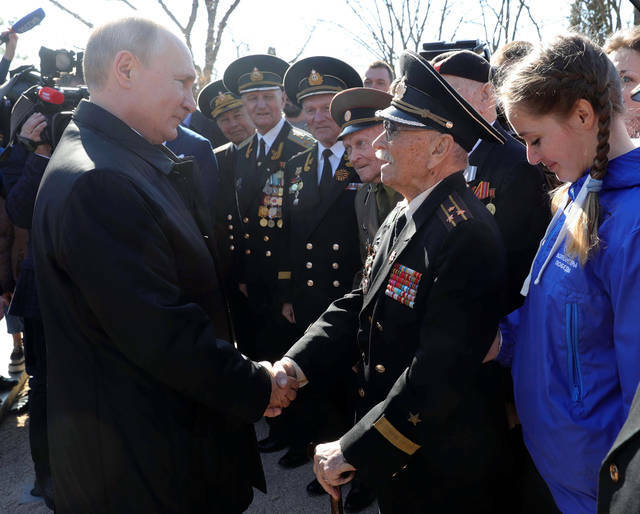 MOSCOW (AP) — Russian President Vladimir Putin marked the fifth anniversary of Russia’s annexation of Crimea from Ukraine by visiting the Black Sea peninsula on Monday, as NATO and the European Union once again strongly condemned the land grab. Russia’s modernization effort has included the construction of a 19-kilometer (11.8-mile) bridge which opened last year across the Kerch Strait that links the Black Sea and the Sea of Azov. 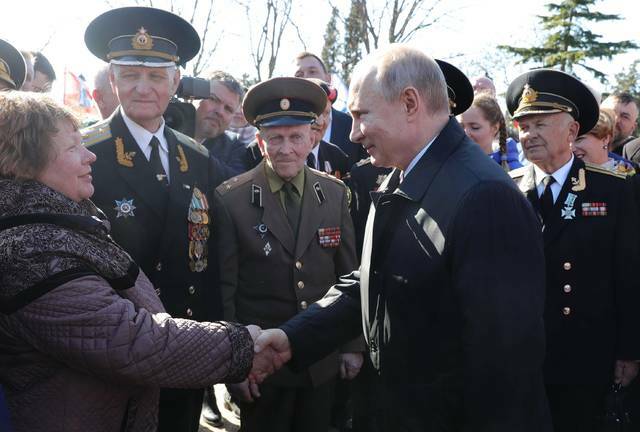 The $3.6-billion project gave Crimea a land link to Russia. Previously, a ferry crossing that was often interrupted by gales served as the only connection. Russia has also beefed up its military presence in Crimea with new navy ships, missiles and warplanes. Viktor Bondarev, the head of the Russian upper house’s defense affairs committee, said the new weapons included the Iskander-M missiles and the Tu-22M3 long-range bombers. The 27,000-square kilometer (10,425-square mile) territory, roughly the size of Massachusetts, became part of Ukraine in 1954 when Soviet leader Nikita Khrushchev transferred jurisdiction from Russia, a move that was a mere formality until the 1991 collapse of the Soviet Union meant that Crimea landed in an independent Ukraine. 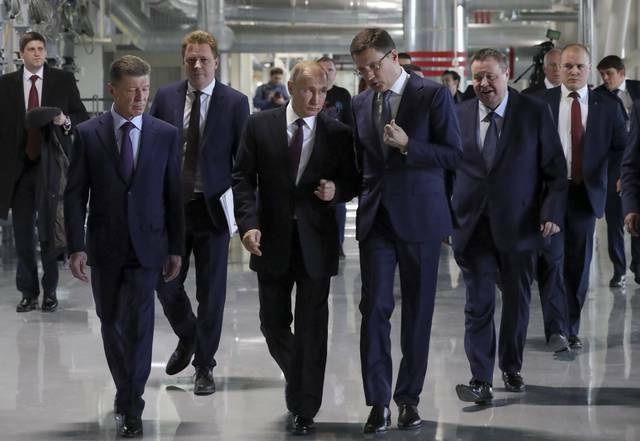 The U.S. and the EU responded to the annexation of Crimea and Moscow’s support for a separatist insurgency in Ukraine’s east with waves of sanctions that have limited Russia’s access to global financial markets and to energy and defense technologies. The Kremlin fired back by cutting imports of most Western food. The annexation of Crimea, a lush peninsula which long has been a favorite vacation destination for Russians, helped bolster Putin’s popularity at home and strengthened Moscow’s positions in the Black Sea. However, public enthusiasm in Russia about the land grab has worn off over years amid the country’s economic difficulties and a plunge in living standards. A poll conducted earlier this month by the Public Opinion Foundation, a Moscow-based survey firm, showed that most Russians continue to support the annexation, but also indicated an increasing public awareness of its costs. The nation-wide survey of 1,500 had 46 percent of respondents saying the seizure of Crimea had a negative impact on the country’s international standing, while 26 percent said it had a positive influence and the rest were undecided. It had a margin of error of no more than 3.6 percentage points. KURCHALOY, Russia (AP) — A court in Russia’s province of Chechnya has sentenced a prominent rights activist to four years in prison on drug charges widely seen as an effort by the authorities to stifle a critical voice. The court in Chechnya’s city of Shali sentenced Oyub Titiyev to four years in penal colony on charges of drug possession he has denied as fabricated. His lawyers said they would appeal the verdict. Chechen leader Ramzan Kadyrov, who previously dismissed rights activists as liars and traitors, publicly called the 61-year-old Titiyev a “junkie.” Titiyev’s supporters said the case aimed not only to silence the activist, who is known as a devout Muslim, but also discredit him in the eyes of the community. She charged that the federal authorities “proved to be accomplices in this gross injustice” by failing to heed the rights defenders’ demands to transfer proceedings out of Chechnya where she said the court was unable to give Titiyev a fair trial because of pressure from regional authorities. “We call on the Russian authorities to immediately and unconditionally release (Titiyev) as he is a prisoner of conscience, imprisoned solely for his human rights work in Chechnya,” Struthers said. Titiyev’s 72-year-old sister Zharadat Titiyeva said that the prosecution aimed not only to silence her brother, but also to smear his reputation as a devout Muslim who doesn’t drink or smoke, let alone take drugs. Oyub Titiyev has been in custody since his arrest in January 2018 on drug possession charges in what has been largely perceived as a vendetta against a rare critic of the Chechen government. Titiyev was the head of the Chechen office of prominent rights group Memorial and played a major role in exposing extrajudicial killings, kidnappings and torture perpetrated by security forces in Chechnya. Chechen leader Ramzan Kadyrov, who previously dismissed rights activists as liars and traitors, publicly called the 61-year-old Titiyev a “junkie.” Titiyev’s supporters say the case aims not only to silence the activist, who is known as a devout Muslim, but also discredit him in the eyes of the community. Disclosure statement: Gilles Pison does not work for, consult, own shares in or receive funding from any company or organization that would benefit from this article, and has disclosed no relevant affiliations beyond their academic appointment. Partners: Sorbonne Universités provides funding as a founding partner of The Conversation FR. Muséum National d’Histoire Naturelle provides funding as a member of The Conversation FR. The proportion of immigrants varies considerably from one country to another. In some, it exceeds half the population, while in others it is below 0.1%. Which countries have the most immigrants? Where do they come from? How are they distributed across the world? We provide here an overview of the number and share of immigrants in different countries around the world. According to the United Nations, the United States has the highest number of immigrants (foreign-born individuals), with 48 million in 2015, five times more than in Saudi Arabia (11 million) and six times more than in Canada (7.6 million) (figure below). However, in proportion to their population size, these two countries have significantly more immigrants: 34% and 21%, respectively, versus 15% in the United States. The first group comprises countries that are sparsely populated but have abundant oil resources, where immigrants sometimes outnumber the native-born population. In 2015, the world’s highest proportions of immigrants were found in this group: United Arab Emirates (87%), Kuwait (73%), Qatar (68%), Saudi Arabia, Bahrain, and Oman, where the proportion ranges from 34% to 51%. The second group consists of very small territories, microstates, often with special tax rules: Macao (57%), Monaco (55%), and Singapore (46%). The third group is made up of nations formerly designated as “new countries”, which cover vast territories but are still sparsely populated: Australia (28%) and Canada (21%). The fourth group, which is similar to the third in terms of mode of development, is that of Western industrial democracies, in which the proportion of immigrants generally ranges from 9% to 17%: Austria (17%), Sweden (16%), United States (15%), United Kingdom (13%), Spain (13%), Germany (12%), France (12%), the Netherlands (12%), Belgium (11%), and Italy (10%). The fifth group includes the so-called “countries of first asylum”, which receive massive flows of refugees due to conflicts in a neighbouring country. For example, at the end of 2015, more than one million Syrian and Iraqi refugees were living in Lebanon, representing the equivalent of 20% of its population, and around 400,000 refugees from Sudan were living in Chad (3% of its population). With 29% immigrants, Switzerland is ahead of the United States, while the proportion in Luxembourg is even higher (46%). Both the attractiveness and size of the country play a role. The smaller the country, the higher its probable proportion of foreign-born residents. Conversely, the larger the country, the smaller this proportion is likely to be. In 2015, India had 0.4% of immigrants and China 0.07%. However, if each Chinese province were an independent country – a dozen provinces have more than 50 million inhabitants, and three of them (Guangdong, Shandong, and Henan) have about 100 million – the proportion of immigrants would be much higher, given that migration from province to province, which has increased in scale over recent years, would be counted as international and not internal migration. Conversely, if the European Union formed a single country, the share of immigrants would decrease considerably, since citizens of one EU country living in another would no longer be counted. The relative scale of the two types of migration – internal and international – is thus strongly linked to the way the territory is divided into separate nations. All immigrants (in-migrants) are also emigrants (out-migrants) from their home countries. Yet the information available for counting emigrants at the level of a particular country is often of poorer quality than for the immigrants, even though, at the global level, they represent the same set of people. Countries are probably less concerned about counting their emigrants than their immigrants, given that the former, unlike the latter, are no longer residents and do not use government-funded public services or infrastructure. However, emigrants often contribute substantially to the economy of their home countries by sending back money and in some cases, they still have the right to vote, which is a good reason for sending countries to track their emigrant population more effectively. The statistical sources are another reason for the poor quality of data on emigrants. Migrant arrivals are better recorded than departures, and the number of emigrants is often estimated based on immigrant statistics in the different host countries. The number of emigrants varies considerably from one country to another. India headed the list in 2015, with nearly 16 million people born in the country but living in another (see the figure below); Mexico comes in second with more than 12 million emigrants living mainly in the United States. Proportionally, Bosnia and Herzegovina holds a record: there is one Bosnian living abroad for two living in the country, which means that one-third of the people born in Bosnia and Herzegovina have emigrated (figure below). Albania is in a similar situation, as well as Cape Verde, an insular country with few natural resources. Some countries are both immigration and emigration countries. This is the case of the United Kingdom, which had 8.4 million immigrants and 4.7 million emigrants in 2015. The United States has a considerable number of expatriates (2.9 million in 2015), but this is 17 times less in comparison to the number of immigrants (48 million at the same date). Until recently, some countries have been relatively closed to migration, both inward and outward. This is the case for Japan, which has few immigrants (only 1.7% of its population in 2015) and few emigrants (0.6%). According to the United Nations, there were 258 million immigrants in 2017, representing only a small minority of the world population (3.4%); the vast majority of people live in their country of birth. The proportion of immigrants has only slightly increased over recent decades (30 years ago, in 1990, it was 2.9%, and 55 years ago, in 1965, it was 2.3%). It has probably changed only slightly in 100 years. But the distribution of immigrants is different than it was a century ago. One change is, in the words of Alfred Sauvy, the “reversal of migratory flows” between North and South, with a considerable share of international migrants now coming from Southern countries. Today, migrants can be divided into three groups of practically equal size (figure above): migrants born in the South who live in the North (89 million in 2017, according to the United Nations); South-South migrants (97 million), who have migrated from one Southern country to another; and North-North migrants (57 million). The fourth group – those born in the North and who have migrated to the South – was dominant a century ago but is numerically much smaller today (14 million). Despite their large scale, especially in Europe, migrant flows generated since 2015 by conflicts in the Middle East have not significantly changed the global picture of international migration. For more information, see “The number and proportion of immigrants in the population: International comparisons”, issue no. 563 of Population and Societies (downloadable free of charge). This article was originally published in French.